When it comes to game room games, the choices are endless. From pool tables to golf games to strength-testing punching bags, there’s something out there for everyone and every game room. Few games, however, have captured the imagination and captivated fans like the always-entertaining bubble hockey. For a blur of excitement and friendly competition, not many games come close to the excitement a good bubble hockey table can provide. Unique because it is basically a simulation that is a much smaller version of the real thing, bubble hockey has been around for almost 90 years and continues to entertain with its fast game play and easy-to-learn skill set. Invented by Canadian Donald Munro Sr. during the depression, the game was made for his family as a Christmas present. Cobbling together butcher’s twine, clock springs, scrap lumber and used coat hanger wire, Donald was able to assemble the first table hockey game for his family in 1932. Mr. Munro was encouraged to take his new game to local department store to sell on consignment. Before he got home the first model was sold, more orders were placed and the rest is bubble hockey history! Many variations of table hockey have existed throughout the years ranging from the very simple and inexpensive to the tank-like modern arcade versions we see today. The smaller toy-versions are great for kids and as a gauge on your family’s interest level in the sport but if you want to have some real serious hockey fun, there’s nothing quite like a quality-built bubble hockey table for your game room. Given the physical nature of the game itself (think quick flicks of the wrists followed by entire body swings in the heat of the action) bubble hockey tables have to be built to withstand the force that is going to be put on them through normal game play alone, plus when things get intense! Knowing that hockey enthusiasts are some of the most ravenous of any sports fans, we at Game Room Guys in Metro Detroit realize that we have to carry bubble hockey units that will put up with the intensity of the game and its fan base alike. Manufacturers like Holland Bar Stool and Shelti understand the attention to detail that must go into the design and production of each bubble hockey gaming table and it shows through their high-quality products that we proudly carry. Manufactured less than 30 minutes from our headquarters in Grand Rapids, Michigan, Holland Bar Stool is a leader in bubble hockey tables today! Officially licensed (and available in dozens of college and pro teams) the table not only looks amazing but plays even better! Units are all badged with your favorite team’s logo on the base, sides and at center ice, leaving no doubt who your hockey allegiance is to. The hour-glass base pedestal design provides a sturdy foundation for your energetic hockey games to unfold on. Sturdy 2-piece base makes sure the unit isn’t going anywhere during gameplay and heavy-duty, adjustable leg levelers provide that the game will be level on almost any surface. Levelers are made from hard plastic and are less likely to scratch or mare floors as well. Rubberized grips provide great traction for your hands minimizing slippage and enhancing gameplay. High-tensile steel rods, that are ground and plated, maneuver steel re-enforced, polymer players and provide a game unit that will last for years. The high-performance rod assembly under the playfield (or rink) converts player’s twisting motion with a 2:1 ratio for a quick, more responsive game. Holland Bar Stool’s player clutch system prevents gears from being damaged when players are battling for possession of the puck, minimizing gearbox repairs and replacements. The side mounted scoring unit makes a variety of game modes available and lets players focus on the game, not keeping track of the score. Scoring unit allows players to adjust announcer volume, game time, point limits and more. 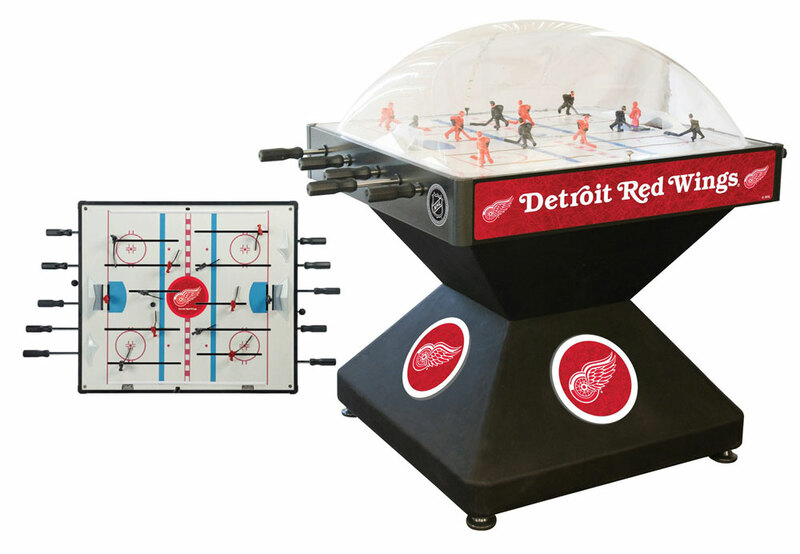 A great way to provide endless entertainment while also showing your pride for your favorite sports team on a top-of-the-line bubble hockey table. Stop into one of our beautiful showrooms and play a game yourself! We always have this model set-up and ready to play in our Grand Rapids and Livonia locations. Don’t worry, one of our sales staff will be more than happy to drop everything and play a few games! 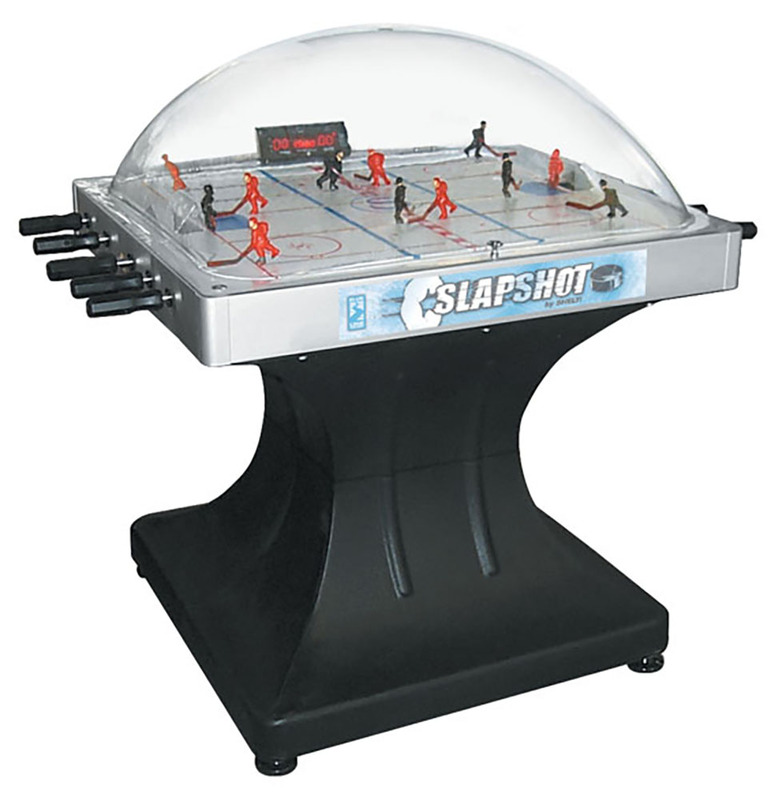 Invite some guests over to watch the big game and play some big games on Shelti’s Slapshot Dome Hockey table. Built to withstand wrist, backhand, snap and its namesake, slap shots, this bubble hockey table is everything you need for your game room and more! The 2 piece, split molded base provides ample support for the playfield and allows for easy installation through tight spaces. 4 leg levelers let you level the unit in almost any environment for a balanced playfield and better overall gameplay. Ultra-smooth chrome-plated rods are precision-ground and use the high-lubricity of nylon bushings to provide exceptional play performance with minimal frictional wear to the game unit. This lets players react to the game action as fast it comes at them, allowing for unbelievably brisk action and blurred black pucks blasting around the bubble! The gearbox clutch system allows competitors to battle for the puck with their players without worrying about damaging the gear boxes or individual players. The players themselves are reinforced with steel supports in their base which allows for more pressure and torque to be applied during intense puck possession warfare. Players seem to ‘skate’ effortlessly across the screen printed playfield graphics that adorn the rink and add to the realism of the unit. The playfield is then covered with a protective clear-coat that promises use for years and years to come! Using a 2:1 gear box turn ratio, players are able to move their men a full 360 degrees with a simple flick of their wrist for easy puck movement around the playfield. All of the under field components are protected by a support system of integrated aluminum extrusions and MDF that brace the playfield and make this unit even more durable. The electronic scoring unit uses infrared scoring, is easy to read and is side-mounted to keep player sight lines clear for following the incredibly fast hockey games. Scoreboard allows players to adjust period length, final score, volume and more! This bubble hockey unit is serious fun and is built to last for generations to come. A great way to get your family into the great sport of hockey or continue the Hockey Town tradition right in your own game room! The Shelti Breakout Dome hockey table is a bit of departure (or breakout, if you will) from other bubble hockey units. Sporting four legs instead of a pedestal base and possessing a lower profile dome than the previous game tables, this might be just the bubble hockey table you’ve been looking for. The lower profile dome also makes for more options for placement, for an added benefit in smaller spaces. Meeting at the intersection of craftsmanship and affordability, this table gives you all the benefits of a commercial grade bubble hockey but on a home game room budget. So your kids will be able to play the game until college and you still might have a little money left over to help them move out! Four sturdy legs support the solid MDF playfield and cabinet that is available in black or blue to match a variety of decors. Each leg features an adjustable leg leveler that’ll allow you to level this table in almost any environment for a perfect playing surface. Chrome-plated rods move the players effortlessly around the rink with the assistance of nylon bushings and gearboxes. Gearboxes feature a clutching mechanism to avoid damage to the players and boxes themselves during game play. The gearboxes are set at a 2:1 ratio, meaning less effort from the player and more action on the playfield for quick turns and shots on goal. Shelti again reinforces their players with a steel peg at the base, strengthening the figurine and also allowing players to apply more pressure and torque to their shots or when duking it out for the puck. The side-mounted score board allows the players to concentrate on the game and not keeping track of the score. Crisp, clear LED scoring display is easy to read and allows players to adjust the volume, period length, choose final score and more! Endless hours of hockey fun! Screams, shouts and yells of excitement as competitors are narrowly defeated or barely secure victory! Purchasing a game that you know will last for decades for your family and friends to enjoy! Heck, the bubble even keeps people from setting drinks down on the game and other hazards from damaging the playfield- let’s see another game do THAT! 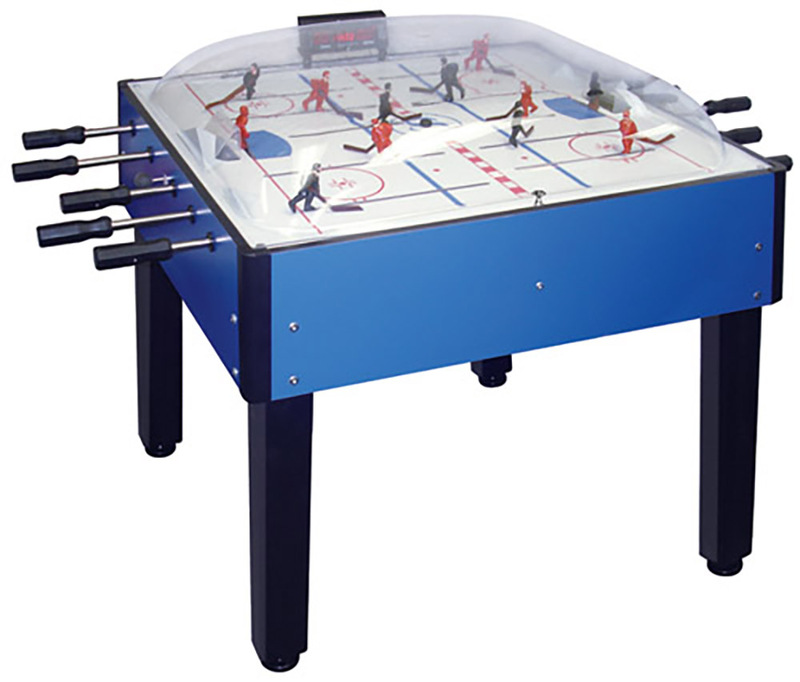 Are You Looking to Buy Bubble Hockey Table in Metro Detroit? The most important reason to buy a bubble hockey, though, is for the memories. 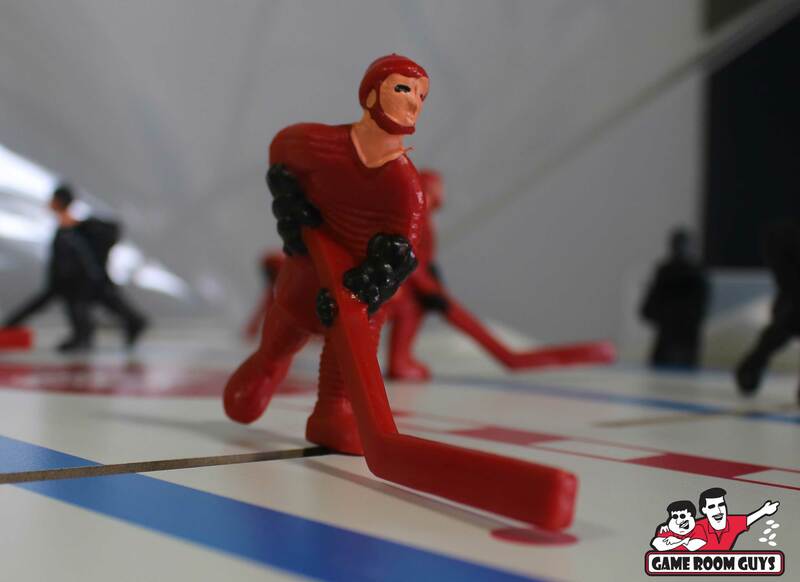 You might not remember all the games you played or your overall win-loss (maybe you will), but you’ll remember all the great times you had beating the ever-living-snot out of your family and friends on your very own high quality bubble hockey table! Now that is the gift that keeps on giving! Visit us today and get your hockey game on point with one of these great units. Game Room Guys in Metro Detroit carries everything bubble hockey related, as well as parts and supplies for anything else under the game room sun! That’s why when it comes to all your game room needs, we’re the guys!